If you are looking for a Cassis hotel right by the beach, check out Le Jardin d’Emile, a hotel-restaurant facing Bestouan Beach. The atmosphere of the small village of Cassis, with its little swimming coves and Mediterranean pine trees, provides a relaxing ambiance in the south of France. While in Cassis, you can swim, roast yourself in the sun, snorkel, kayak or hike along the many cliffs in the area. Don’t forget to sign up for a dégustation (wine-tasting) of the fine wines produced locally. Le Jardin d’Emile has only 7 guest rooms, some of which have a sea view. Every room is outfitted in bright summery colours such as turquoise, yellow and violet. And better yet, the décor changes with the seasons, setting the mood perfectly according to what can be found outdoors. 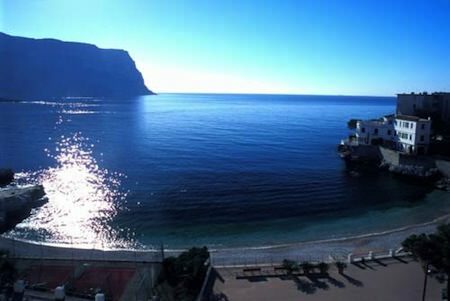 Room rates change based on the type selected and the dates of the stay; they can range anywhere from 84 EUR to 159 EUR per night, which is reasonable for Cassis. The rooms are quite small but you will probably be outdoors most of the time. Small pets are allowed for an extra charge. During high season—typically from April to the end of October—this Cassis hotel offers guests a bar called Pastis. The terrace has gorgeous views of Bestouan Beach and the Cap Canaille—two popular Cassis locations. There is also a restaurant on the premises, in which guests can enjoy a meal or a light snack. Menus are a rich combination of Mediterranean and Asian cuisine. A private beach, Same Same Beach, is also located on the property for guests looking for a more private, relaxing stay. If you want to stay right by the beach in Cassis but want an affordable place, Le Jardin d’Emile is one of the best options in town.